An artist's illustration of the asteroid 'Oumuamua, the first interstellar object ever known to visit our solar system. Our solar system's first known interstellar visitor is likely even more alien than previously imagined, a new study suggests. The mysterious, needle-shaped object 'Oumuamua, which was spotted zooming through Earth's neighborhood last October, probably originated in a two-star system, according to the study. Astronomers could tell that the 1,300-foot-long (400 meters) 'Oumuamua wasn't from around here based on its hyperbolic orbit, which showed that the object wasn't gravitationally bound to the sun. Initially, scientists thought the body was probably a comet. 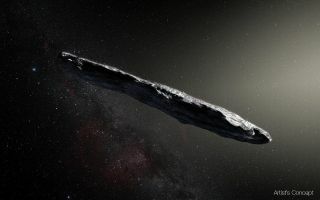 But 'Oumuamua displayed no cometary activity — no long tail, no cloud-like "coma" around its core — even after getting relatively close to the sun, so it was soon reclassified as an asteroid. "It's really odd that the first object we would see from outside our system would be an asteroid, because a comet would be a lot easier to spot, and the solar system ejects many more comets than asteroids," study lead author Alan Jackson, a postdoctoral researcher at the Centre for Planetary Sciences at the University of Toronto Scarborough, said in a statement. But 'Oumuamua probably didn't come from a system like our own, according to the new study. Jackson and his colleagues performed computer-modeling work, which indicated that systems with two close-orbiting stars boot out asteroids much more efficiently than one-star systems do. And there are a lot of these binary systems out there; previous research has suggested that more than half of all Milky Way stars have close stellar companions. Nobody knows for sure where 'Oumuamua came from or how long it's been voyaging through deep space. But the odds are good that it was born into a binary system that harbors at least one big, hot star, according to the new study. That's because such systems are likely to have predominately rocky (as opposed to icy) bodies orbiting relatively close in, in the prime ejection zone. And 'Oumuamua was likely booted out during its natal system's planet-formation period, however long ago that may have been, Jackson and his team said. 'Oumuamua made its closest approach to Earth — about 15 million miles (24 million kilometers) — on Oct. 14. The object is now barreling toward the outer solar system and has been too distant and faint to study even with large telescopes since mid-December, NASA officials have said. But astronomers gathered a slew of data about 'Oumuamua while they could, and they will doubtless be mining this information for a long time to come. "The same way we use comets to better understand planet formation in our own solar system, maybe this curious object can tell us more about how planets form in other systems," Jackson said. The new study was published today (March 19) in the journal Monthly Notices of the Royal Astronomical Society.